Hard rocks are consolidated and fissured formations occupying nearly two-thirds of the geographical area of the country and comprising a wide variety of igneous, volcanic, sedimentary, and metamorphic rocks of Archaean and Precambrian age. In this terrain the aquifers are characteristically thin, discontinuous, of irregular occurrence, and hence of low to moderate yield potentials. The latter depends mainly on the distribution of porosity, imparted by weathering and fracturing, and interconnection of weathered zone with fractured massive layers. Distribution of interconnected fracture systems, openness of fractures, and porosity of vesicular lava flows are the other important factors determining aquifer potentials. Study of long-term groundwater monitoring data reveals declining trend of groundwater levels, increasing overexploitation due to uncontrolled groundwater draft, and deteriorating groundwater quality in several parts of the terrain. Meteorological factors and anthropogenic activities influence the groundwater regime. But the stress on groundwater exploitation is ever-increasing with mounting demand for water calling for scientific management of the resource. 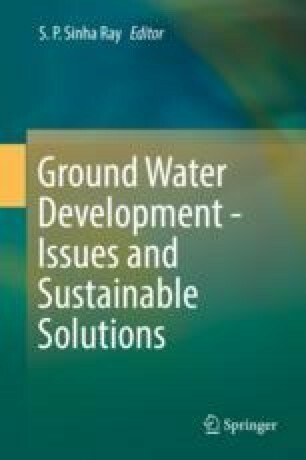 The paper highlights the overall status of knowledge of groundwater in the hard rock terrain of the country and the role of science and technology in groundwater exploration, development, and conservation, presenting a few case studies and setting the agenda for better understanding of the groundwater regime and its management. The author expresses his deep gratitude to Dr. S.P. Sinha Ray for his constant encouragement in writing paper. The paper draws extensively from various published and unpublished sources which are duly acknowledged.